At least four CV-22 Osprey aircraft will arrive in Uganda by midweek, along with refueling aircraft and about 150 Air Force Special Forces and other airmen to fly and maintain the planes. For those who’ve been following this for a long time, 100 special force advisers were sent to Uganda in 2011 to help track down the LRA. This recent news is a huge increase in troop commitment and in other material. So far, the U.S. presence there has helped implement safe reporting sites and coordinate defection messaging efforts, including dropping fliers and flying helicopters with speakers to encourage LRA rebels to surrender. The presence has also helped bolster the Ugandan security sector and further militarized central Africa, though it may have had an effect in monitoring UPDF abuses. The Ospreys are on loan from a base in Djibouti, where they have been under Centcom control. Africom is borrowing them for counter-LRA efforts, but it wouldn’t be surprising if they were there on standby in a region where more and more problems are arising. The Ospreys were already active in the region, attempting to respond when South Sudan descended into chaos in December. Last month, an article by David Wiley, “Militarizing Africa and African Studies and the U.S. Africanist Response,” [gated] appeared in African Studies Review. It’s an important look at what Africanist scholars face in an increasingly militarized field. The piece examines how area studies programs initially developed during the Cold War (for a quick look at that, read this) and how many scholars dealt with attempts to militarize their field. He discusses how there were some scholars in all area studies who were involved in policy-making, but that many were critical of American interventionist policies. Africanists were actually late to the game in this, Wiley explains, but once they did organize against U.S. foreign involvement, (in the 70s, in Angola and South Africa), it was strong and resolute. We believe that the long-term interests of the people of the U.S. are best served by this separation between academic and military and defense establishments. Indeed, in the climate of the post–Cold War years in Africa and the security concerns after 9/11/2001, we believe that it is a patriotic policy to make this separation. This separation ensures that U.S. students and faculty researchers can maintain close ties with African researchers and affiliation with and access to African institutions without question or bias. Such separation, we believe, can produce the knowledge and understanding of Africa that serves the broad interests of the people of the United States as well as our partners in Africa. Establishing the Social Science Research Council in Stuttgart and supporting the Socio-Cultural Research and Advisory Team to provide troops with cultural knowledge. Building a CIA operations base in Somalia with prison, planes, and counterterrorism training for Somali intelligence agents. Establishing bases in Seychelles, Djibouti, and Ethiopia for drones. Expanding intelligence operations with private contractors. Expanding U.S. Special Operations teams in countries without government permission (apparently based on a 2010 directive by Gen. Petraeus. Training hundreds of African military officers at conferences. Providing 100 troops to work with Central African armies in an anti-LRA campaign. Increasing the number of army personnel stationed in Africa by 3000 in Central Africa, Mali, and Somalia. In addition to all of this, AFRICOM’s whole-of-government approach has included engaging in both diplomatic and development work on top of traditional military duties. While some hail this as a more integrated approach, it also blurs the lines between military and non-military actors. As a result, State Department officials and USAID personnel, and even non-governmental aid workers, are being viewed as part of America’s military involvement in Africa. While this was all occurring in Africa, in the United States the field of African Studies has faced a similarly forceful push of militarization. Wiley notes an “unprecedented surge of funding for studying Africa and African languages in the DOD, in intelligence agencies, and in military-focused higher education institutions.” He also estimates that “funding for the study of Africa in U.S. security agencies now exceeds that of American universities probably by a factor of fifty, perhaps more,” despite the fact that universities offer more languages and better instruction. On top of all of this, DoD also sponsors three programs to fund the study of Africa in civilian institutions: the National Security Education Program, the Minerva Research Initiative, and Human Terrain Systems (I worked briefly on a Minerva project while I was a fellow at ASU’s Center for the Study of Religion and Conflict, and wrote about it and Human Terrain Teams here). All of these programs are well-funded projects of the Defense Department, while the U.S. Department of Education cut 46% of Title VI area studies centers (including the 11 Africa universities), with the government favoring area and language study programs run by DoD. In addition to this, the Fulbright-Hays Doctoral Disseration Abroad and Faculty Research Abroad programs were suspended in 2011 and the Summer Cooperative African Language Institute was cancelled in 2012. With non-military funding opportunities shrinking, scholars (and students) are facing a dilemma in how to acquire funds to carry out research and teaching. In this time of austerity, especially at public universities, there is a growing sense that civilian agency funding is collapsing and military and intelligence funding increasingly is the “only game in town.” As a result, two university African centers and linguists in two other universities that have Title VI Africa centers (with the dissent of their African center faculty), have taken funding for African language instruction programs from the DOD’s NSEP. Africanist scholars are beginning to fall under the control of the military as DoD-funded projects dictate what they study, where they do research, and what questions they ask. From here, things will only get worse. Title VI universities are already worried about Foreign Language and Area Studies funding suffering even more egregious cuts (FLAS grants arrive in three-year packages, and the current round of funding expires next summer), and other sources of funding will also be disappearing if Congress continues to cut funding (one needs only to peruse the Department of Education grants site to see how many programs have been suspended or cancelled). Wiley paints a sad picture of where area studies programs stand now, and the possible future we might find ourselves in. If the military controls more and more funding for higher education, our colleges, scholars, and students will have less options. As DoD annexes the social sciences and humanities, will the leading African Studies programs in the country be able to maintain their independence from military control? Or will all researchers and students trying to work in the region be following the army’s orders? LRA Commander Captured! What Does It Mean? Over the weekend, news broke that LRA commander Ceasar Acellam Otto was captured by UPDF soldiers on the border between Central African Republic and the Democratic Republic of Congo. In his 60s, Acellam is a former UNLA fighter, meaning he’s been a rebel since before the LRA were in the game, so he’s a pretty big catch. He was allegedly in charge of intelligence for the LRA, and defectors have alluded to him being the link between Kony and Khartoum. While Acellam is not one of the remaining leaders that has been indicted by the ICC, he is one of the top commanders of the rebel force. His capture could mean a lot of things, but it doesn’t necessarily mean the end is near. The LRA has been increasingly on the run, but has regained some strength. After a long silence in the last months of 2011, during which LRA leader Joseph Kony allegedly ordered his troops to lie low, the rebels have been making a comeback with attacks on the rise in Central African Republic. This is in addition to the steady flow of attacks in the Democratic Republic of the Congo, where UPDF soldiers cannot follow. Against this backdrop, the BBC recently reported on allegations that Sudan was again supporting the LRA, which comes as no surprise. Khartoum supported Kony for years during the 1990s and early 2000s, and with increasing tensions along the Sudan-South Sudan border it would benefit the government to partner with the LRA once again. Indeed, as far back as late 2010 people were saying that Kony could be on his way to Darfur, where he would be safe from international pressure. While Acellam’s capture could deal a huge blow to the LRA, if Kony is already in Sudan then there is no change in the manhunt. As Mark Kersten has pointed out, it’s like playing hide and seek with the seekers in one house and the child hiding in another. 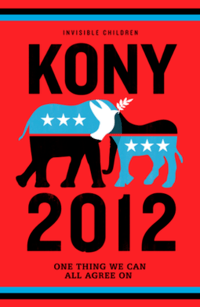 No matter who the coalition of soldiers captures, Kony might not be where they’re looking. Ending LRA violence is obviously in the interests of many, but capturing Joseph Kony has been the stated goal (and means to ending the violence) all along. If the LRA is getting support from Sudan, it’s even more likely than before that LRA fighters and indicted leaders are seeking shelter under Khartoum’s wing. If the LRA leadership enjoys safe haven and impunity, the conflict won’t be over. This morning, the United Nations Security Council failed to pass a watered down resolution addressing human rights abuses and massacres in Syria. Last night, in the hours leading up to the vote, the Syrian government launched a campaign against the city of Homs resulting in anywhere from 200 to 300 deaths. Today, both Russia and China vetoed the UNSC resolution. In the aftermath, there were a number of officials that were furious and ready to unleash. The United States is disgusted that a couple of members of this Council continue to prevent us from fulfilling our sole purpose here-addressing an ever-deepening crisis in Syria and a growing threat to regional peace and security. For months this Council has been held hostage by a couple of members. These members stand behind empty arguments and individual interests while delaying and seeking to strip bare any text that would pressure Asad to change his actions. This intransigence is even more shameful when you consider that at least one of these members continues to deliver weapons to Asad. Since these two members last vetoed a resolution on Syria, an estimated 3,000 more civilians have been killed. 3,000. Another almost 250 killed just yesterday. Many thousands more have been held captive and tortured by Asad and his shabiha gangs. Since these two members last vetoed a resolution, however, and despite the absence of Security Council action, we have seen more and more Syrians speak out in peaceful demonstrations against the regime. Once again, the courageous people of Syria can clearly see who on this Council supports their yearning for liberty and universal rights-and who does not. And during this season of change, the people of the Middle East can now see clearly which nations have chosen to ignore their calls for democracy and instead prop up desperate dictators. Those who opposed this resolution have denied this last chance to end Asad’s brutality through peaceful means under Arab League auspices. Any further blood that flows will be on their hands. Four months ago, to the day, two Council members vetoed an attempt to send a clear message to the Syrian regime to end the bloodshed. That day, the death toll stood at 3,000. And the Syrian regime only continued its brutal repression. The death toll today stands at around 6,000. The Syrian regime has ferociously escalated its already brutal repression in the last 24 hours, subjecting the citizens of Homs to artillery and heavy weaponry. The death toll will be high. Those that blocked Council action today must ask themselves how many more deaths they are prepared to tolerate before they support even modest and measured action? Last Tuesday, this Council – and the world – heard from His Excellency Sheikh Hamad bin Jassim of Qatar and the Secretary-General of the League of Arab States. They came with a simple request for Security Council support for the Arab League’s plan to facilitate a political transition and bring about a peaceful resolution to the crisis. The original Moroccan draft resolution did just that. It had, from the outset, support from the vast majority of Council members and had the backing of the Arab League. Yet some Council members argued that the resolution imposed regime change. It said no such thing. But in an attempt to reach consensus, we provided further assurances in the text. The same minority argued that the text could somehow be used to authorise military intervention. It did no such thing – it was a Chapter VI resolution. But in an attempt to reach consensus, we provided further assurances in the text. The same minority argued that very modest language expressing concern about weapons was somehow tantamount to an arms embargo. It was not. But we took it out. They said that mere mention of the existence of Arab League sanctions was tantamount to sanctions. It was not. But we took it out in an effort to reach consensus. The facts speak for themselves. There is nothing in this text that should have triggered a veto. We removed every possible excuse. The reality is that Russia and China have today taken a choice: to turn their backs on the Arab world and to support tyranny rather than the legitimate aspirations of the Syrian people. They have failed in their responsibility as permanent members of the Security Council. And they have done so on the most shameful of days of the Syrian killing machine’s 300 days of repression. I’ll add more quotes throughout the day as I find reliable sources.